Space shuttle Enterprise, NASA's original prototype orbiter, will hit the road — and water — for the trip to its Manhattan museum over the next five days after sitting at a New York airport for the past month. The shuttle will arrive by barge at the Intrepid Sea, Air and Space Museum on Tuesday (June 5), weather permitting, where it is set to go on public display in July. Enterprise, which did not fly in space but was used for a series of approach and landing tests in the 1970s, was ferried on top of a NASA jumbo jet from the Smithsonian's National Air and Space Museum in Chantilly, Va., to John F. Kennedy (JFK) International Airport in New York on April 27. 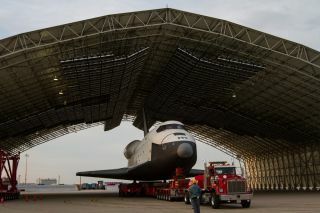 After being lifted off the space agency's modified Boeing 747 aircraft in mid-May, Enterprise was parked under an open-air hangar at the airport to await its river ride to the Intrepid, a converted World War II aircraft carrier, which is berthed on the west side of Manhattan. On Sunday morning (June 3), Enterprise, atop the barge, will depart JFK. A tugboat will pull it along the shores of Queens and Brooklyn, passing the Gil Hodges Memorial Bridge by mid-afternoon. The space shuttle-topped barge will then pass Coney Island and go under the Verrazano Bridge before docking at Port Elizabeth in New Jersey for the evening. On Monday, Enterprise will remain berthed in New Jersey, as preparations continue for its delivery to the Intrepid the next day. On Tuesday (June 5), at 9:15 a.m. EDT (1315 GMT), the barge will depart the Jersey shore to deliver Enterprise to the Intrepid, which is docked at Pier 86 at W. 46th Street and 12th Avenue in New York City. On its way, the barge is expected to take the shuttle past the Statue of Liberty at about 9:50 a.m. EDT (1350 GMT) and the World Trade Center about 50 minutes later before traveling up the Hudson River to complete its journey by 11:30 a.m. EDT (1530 GMT). The dates and times of Enterprise's trip up the Hudson are subject to change, as they're based on weather and water conditions. Once positioned beside the aircraft carrier, Enterprise will be hoisted by crane off the barge and onto the flight deck so that its nose faces the river. The craning operation is expected to take about three hours to complete. Workers will then begin erecting a climate-controlled steel and fabric shelter over Enterprise, to protect it while it is on display. The Intrepid's new "Space Shuttle Pavilion" is scheduled to open to the public July 19. Tickets for the new display are on sale now through the museum's box office and website.